What Are The Different Parts Of A Volcano? Without a doubt, volcanoes are one of the most powerful forces of nature a person can bear witness to. Put simply, they are what results when a massive rupture takes place in the Earth’s crust (or any planetary-mass object), spewing hot lava, volcanic ash, and toxic fumes onto the surface and air. Originating from deep within the Earth’s crust, volcanoes leave a lasting mark on the landscape. While volcanoes come in a number of shapes and sizes, certain common elements can be discerned. The following gives you a general breakdown of a volcanoes specific parts, and what goes into making them such a titanic and awesome natural force. A magma chamber is a large underground pool of molten rock sitting underneath the Earth’s crust. The molten rock in such a chamber is under extreme pressure, which in time can lead to the surrounding rock fracturing, creating outlets for the magma. This, combined with the fact that the magma is less dense than the surrounding mantle, allows it to seep up to the surface through the mantle’s cracks. When it reaches the surface, it results in a volcanic eruption. Hence why many volcanoes are located above a magma chamber. Most known magma chambers are located close to the Earth’s surface, usually between 1 km and 10 km deep. In geological terms, this makes them part of the Earth’s crust – which ranges from 5–70 km (~3–44 miles) deep. Lava is the silicate rock that is hot enough to be in liquid form, and which is expelled from a volcano during an eruption. The source of the heat that melts the rock is known as geothermal energy – i.e. heat generated within the Earth that is leftover from its formation and the decay of radioactive elements. When lava first erupted from a volcanic vent (see below), it comes out with a temperature of anywhere between 700 to 1,200 °C (1,292 to 2,192 °F). As it makes contact with air and flows downhill, it eventually cools and hardens. 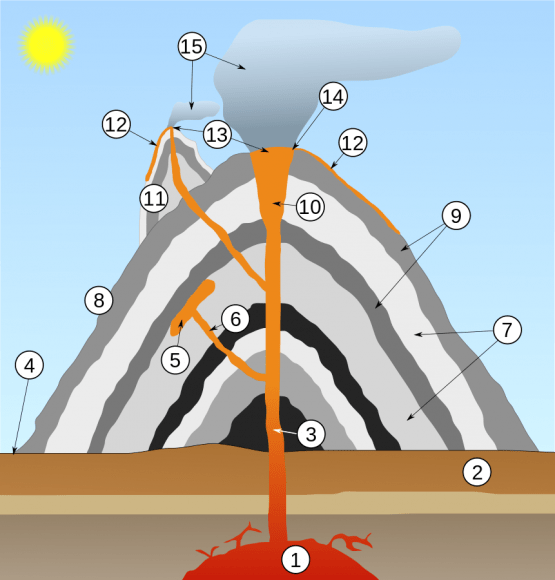 A volcano’s main vent is the weak point in the Earth’s crust where hot magma has been able to rise from the magma chamber and reach the surface. The familiar cone-shape of many volcanoes are an indication of this, the point at which ash, rock and lava ejected during an eruption fall back to Earth around the vent to form a protrusion. 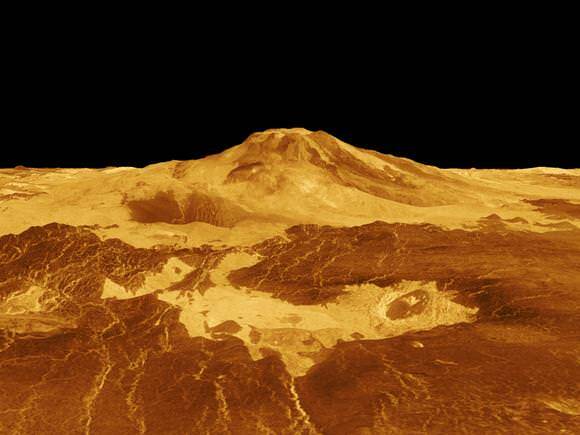 The uppermost section of the main vent is known as the volcano’s throat. As the entrance to the volcano, it is from here that lava and volcanic ash are ejected. In addition to cone structures, volcanic activity can also lead to circular depressions (aka. craters) forming in the Earth. A volcanic crater is typically a basin, circular in form, which can be large in radius and sometimes great in depth. In these cases, the lava vent is located at the bottom of the crater. They are formed during certain types of climactic eruptions, where the volcano’s magma chamber empties enough for the area above it to collapse, forming what is known as a caldera. Otherwise known as a pyroclastic density current, a pyroclastic flow refers to a fast-moving current of hot gas and rock that is moving away from a volcano. Such flows can reach speeds of up to 700 km/h (450 mph), with the gas reaching temperatures of about 1,000 °C (1,830 °F). Pyroclastic flows normally hug the ground and travel downhill from their eruption site. Their speeds depend upon the density of the current, the volcanic output rate, and the gradient of the slope. Given their speed, temperature, and the way they flow downhill, they are one of the greatest dangers associated with volcanic eruptions and are one of the primary causes of damage to structures and the local environment around an eruption site. Volcanic ash consists of small pieces of pulverized rock, minerals and volcanic glass created during a volcanic eruption. These fragments are generally very small, measuring less than 2 mm (0.079 inches) in diameter. This sort of ash forms as a result of volcanic explosions, where dissolved gases in magma expand to the point where the magma shatters and is propelled into the atmosphere. The bits of magma then cool, solidifying into fragments of volcanic rock and glass. View of volcanic ash spewing from the Eyjafjallajokull volcano in Iceland. Credit: ©Snaevarr Gudmundsson. Because of their size and the explosive force with which they are generated, volcanic ash is picked up by winds and dispersed up to several kilometers away from the eruption site. Due to this dispersal, ash an also have a damaging effect on the local environment, which includes negatively affecting human and animal health, disrupting aviation, disrupting infrastructure, and damaging agriculture and water systems. Ash is also produced when magma comes into contact with water, which causes the water to explosively evaporate into steam and for the magma to shatter. In addition to ash, volcanic eruptions have also been known to send larger projectiles flying through the air. Known as volcanic bombs, these ejecta are defined as those that measure more than 64mm (2.5 inches) in diameter, and which are formed when a volcano ejects viscous fragments of lava during an eruption. These cool before they hit the ground, are thrown many kilometers from the eruption site, and often acquire aerodynamic shapes (i.e. streamlined in form). While the term applies to any ejecta larger than a few centimeters, volcanic bombs can sometimes be very large. There have been recorded instances where objects measuring several meters were retrieved hundreds of meters from an eruptions. Small or large, volcanic bombs are a significant volcanic hazard and can often cause serious damage and multiple fatalities, depending on where they land. Luckily, such explosions are rare. On large volcanoes, magma can reach the surface through several different vents. Where they reach the surface of the volcano, they form what is referred to as a secondary vent. Where they are interrupted by accumulated ash and solidified lava, they become what is known as a Dike. And where these intrude between cracks, pool and then crystallize, they form what is called a Sill. Also known as a Parasitic Cone, secondary cones build up around secondary vents that reach the surface on larger volcanoes. As they deposit lava and ash on the exterior, they form a smaller cone, one that resembles a horn on the main cone. Yes indeed, volcanoes are as powerful as they are dangerous. And yet, without these geological phenomena occasionally breaking through the surface and reigning down fire, smoke, and clouds of ash, the world as we know it would be a very different place. More than likely, it would be a geologically dead one, with no change or evolution in its crust. I think we can all agree that while such a world would be much safer, it would also be painfully boring! We have written many interesting articles about volcanoes here at Universe Today. 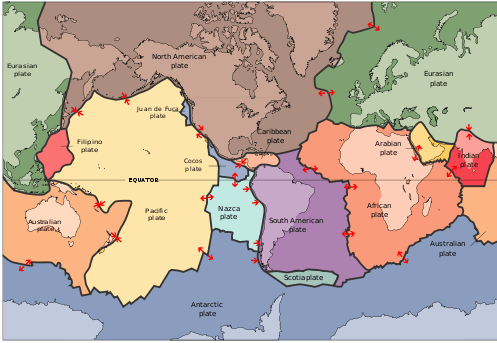 Here’s is one about the different types of volcanoes, one about composite volcanoes, and here’s one on the famous volcanic belt, the Pacific “Ring of Fire”.